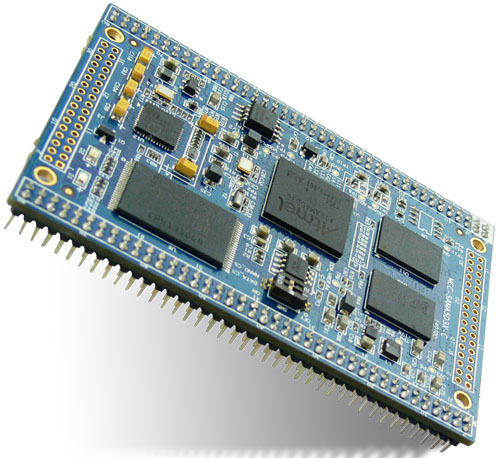 The MYD-SAMA5D3X-C Development Board is a low-cost evaluation platform for Atmel’s SAMA5D3 ARM Cortex-A5 processor-based MPU which can operate at up to 536MHz (850DMIPS) at under 150mW and is ideal for various industrial application such as control panels, smart grid devices and bar code scanners - anything that needs high levels of connectivity, enhanced user interfaces, robust security, or battery operation. The MYD-SAMA5D3X-C Development board is using a base board for MYIR’s MCC-SAMA5D3X-C CPU Module which is a System on Module (SoM) for the heart of the system. The CPU module MCC-SAMA5D3X-C has 512MB DDR2 SDRAM, 256MB Nand Flash, 4MB Data Flash, 64KB EEPROM and Gigabit Ethernet PHY on board. It is connected with the base board through two 2.0mm pitch 80-pin male pin headers. 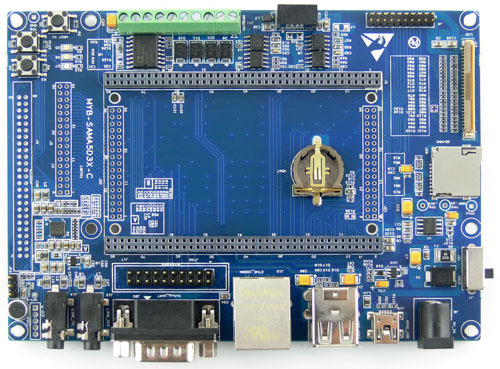 The base board has all extended interfaces for software development including up to six serial ports, one 10/100/1000Mbps Ethernet, two CAN, two USB Host and one USB OTG, TF card, JTAG and more others. 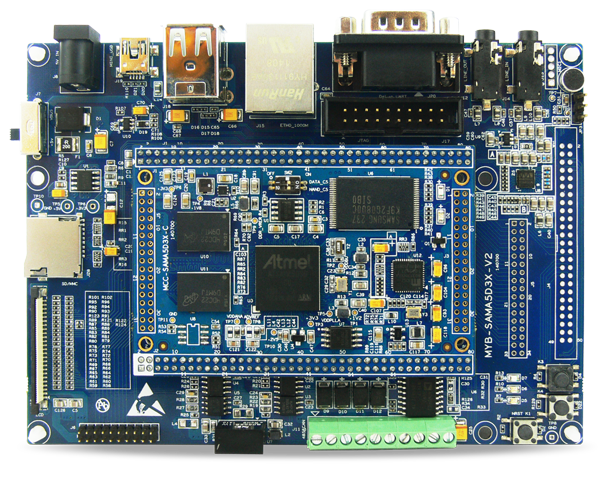 MYIR also offers 4.3- and 7-inch LCD Modules, USB WiFi and Camera modules for this board as options. 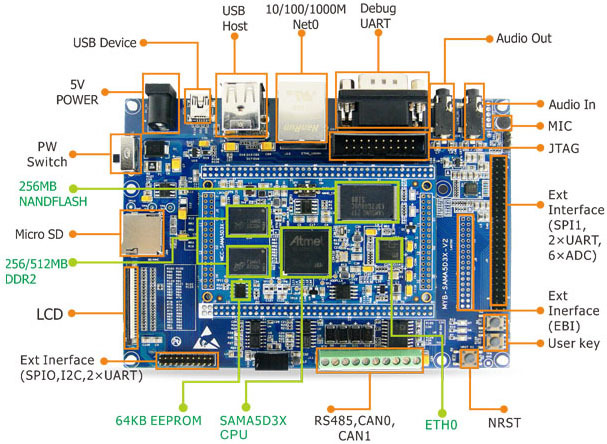 The Linux, Android SDK and detailed user manual for this board are offered to enable your rapid evaluation and development based on Atmel SAMA5D3 series processors. 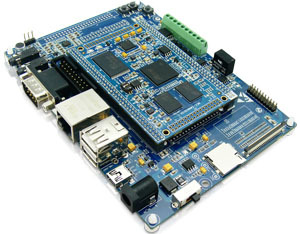 User can also use the MYD-SAMA5D3X-C board directly as control or display unit for your embedded products. The main differences can be seen from below table. MYIR deliveries the MYD-SAMA5D36-C model by default. 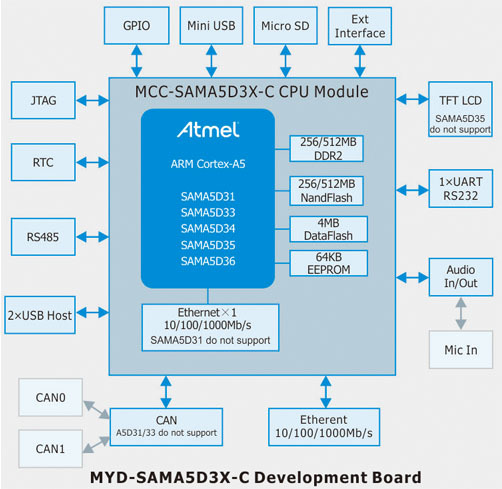 The Atmel SAMA5D3 series of microprocessor units (MPUs) is based on the ARM® Cortex™-A5 processor, operating at up to 536MHz (850DMIPS) at under 150mW, delivering a high-performance, low-power platform for cost-sensitive industrial and consumer applications. It has comprehensive peripheral set for connectivity and user interface applications including Gigabit and 10/100 Ethernet, up to three HS USB ports, dual CAN, three SDIO/SD/MMC, UARTs, SPIs, TWIs, soft modem, LCD controller with graphics accelerator, camera interface, 12-bit ADC, 32-bit timers and more. 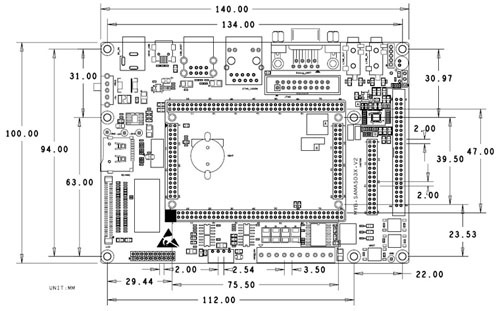 Figure 1-3 SAMA5D3 Series Key Features The MYD-SAMA5D3X series development boards include one CPU module mounted on one base board. 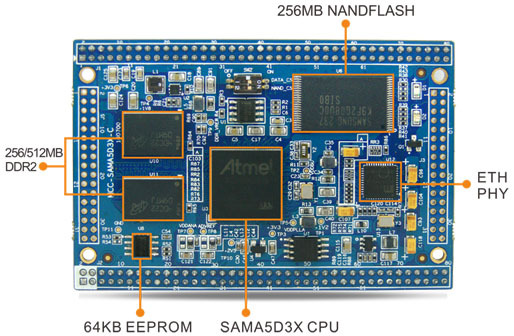 It exposes many of the Atmel SAMA5D3 features to the user in support of developing specific solutions. You can download relative chip datasheet, products datasheet, user manual, software package from below. Any inquiry, please contact MYIR. 1. One MYD-SAMA5D3X-C Development Board includes one CPU module MCC-SAMA5D3X-C mounted on the base board. If you need more CPU module, you can order extra ones. 3. The board is delivered with above configurations by default. If you need other CPU, RAM or Flash configurations, please contact MYIR for availability. 4. We accept custom design based on the MYD-SAMA5D3X-C, whether reducing, adding or modifying the existing hardware according to customer’s requirement.